How can satellites promise to predict future environmental risks and threats? Global warming and resulting environmental changes are unfolding at an ever-faster pace. Natural disasters threaten the well-being of communities across the globe and debates around whether environmental change can (or should) be considered security risks are more topical than ever. My recent article in Security Dialogue, ‘Seeing like a Satellite: Remote Sensing and the Ontological Politics of Environmental Security,’ offers a new perspective on environmental security. This perspective focuses on the crucial role of visual technologies, such as satellite observation, for the identification of environmental risks and threats as well as the definition of appropriate coping measures. The article traces how satellite observation technology and the idea of environmental change as a security problem itself, both emerged in the same context of a militarization of the geosciences during the Cold War. 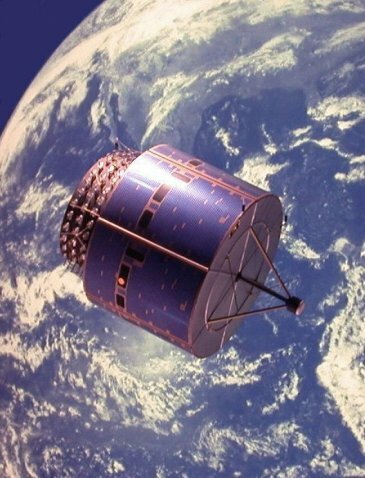 Satellite technology rendered large-scale environmental change visible, thereby allowing the emergence of a global conscience for problems such as climate change, the ozone hole, and deforestation, among others. At the same time, the fusion of military and research needs established novel relations between actors in the security and the environmental fields. While satellite technology remained firmly in the hand of the superpowers’ militaries, environmental security at that time also had its focus primarily on nation states in the context of ‘threats’ like looming resource conflicts or an influx of environmental migrants. In the aftermath of the Cold War the opening of satellite technology to a range of nongovernmental actors like environmental and development NGOs and researchers went along with a redefinition of environmental security in general. In the aftermath of the Cold War however, the opening of satellite technology to a range of nongovernmental actors like environmental and development NGOs and researchers went along with a redefinition of environmental security in general. Today, NGOs are using satellite imagery in their work to provide protection to local populations and ecosystems against natural disasters and environmental changes – thereby shifting the focus of environmental security from nation states to local communities. Further, an emerging commercial intelligence industry around global players like Google or DigitalGlobe promises to make future environmental risks predictable through what the article calls ‘big environmental data’ – the collection, harmonization and analysis of a broad range of data sources. As I note in my article, the question of how to evaluate these developments is not easy to answer. The shift of environmental security thinking away from nation states towards the protection of endangered communities, as well as the growing availability of satellite data, are certainly welcome changes. NGOs’ access to high-resolution imagery also provides them with the means to monitor and control populations at a distance. However, in a commercialized satellite intelligence market imagery is far from being freely available. Instead of military secrecy, it is now property-rights regimes and the heavy price tag on satellite images that can limit access to that data. Finally, the promise of ‘big environmental data’, with the goal of rendering the future predictable, draws on a problematic understanding of societies as quantifiable structures that misses the complexities of socio-environmental relations.